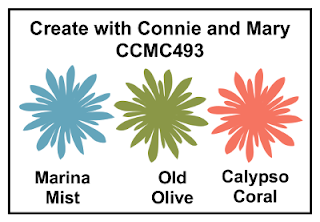 I must admit that I am guilty of not using Marina Mist very often, so it was fun to be challenged with it. It's really pretty with Old Olive and Calypso Coral. 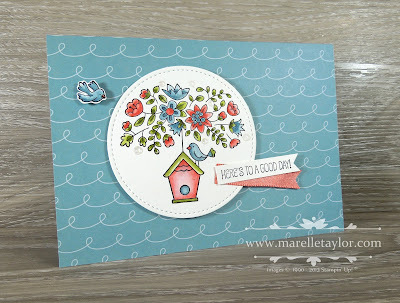 I CaSEd the layout for this card from page 41 of the Occasions Catalogue. The sentiment is from A Good Day on page 14. I popped a little piece of the shimmery Sale-a-Bration ribbon behind it. I used the Sweet Soiree Specialty paper in the background. It's hard to tell in the photo, but I've added a touch of sparkle using some of the Glitter Epoxy Dots on page 33.